Why did you change the listing pages? With the launch of the new finda website design there are a variety of changes, none the least is the complete overhaul of the listing pages. When it comes to changing a site like finda, it’s not an easy undertaking. We have a lot of things to consider and take into account. It’s equally important to get things right for the site users, as much as it is for those advertising on the site. Where are they – or – Where is the closest branch to me? In the image above you can see we focused the core part of the listing page to answering those 4 questions as quickly as possible for the site visitor. 1 The company name – who are they? 2 Business summary – what do they do? 3 Full contact details – how do I contact them? 4 The address & map – where are they? The new map allows the user to do so much more on the listing page. 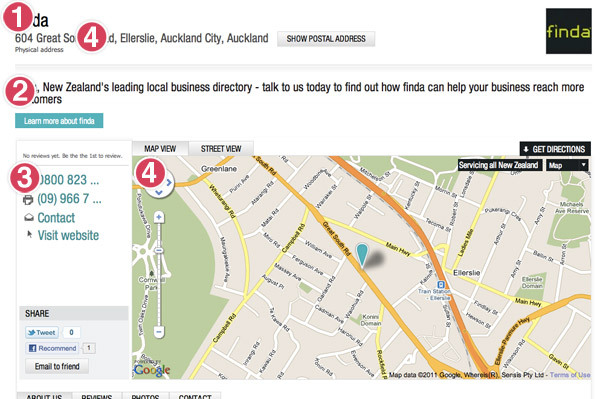 Directions to and from a business are fetched & displayed right there on the listing. If the business has branches – every single branch can be found on the listing, allowing a user to very quickly find the branch closest to them. We’re excited by what this new focus will allow finda to do in the near future. What about my images, description and more? Of course these things are hugely important to your listing. Historically these were all on individual pages, now they are all on the one page – adding a massive amount of power to the listing pages. We’ve added a bunch of “quick links” to these tabs from search results and other places – which will encourage exploration of your listing. You might also notice we have a new floating contact bar – that means YOUR contact details are always on the page for someone to interact with you quickly and easily.